When I first began the journey of overcoming my food addiction, I attended 12-Step meetings, read the literature between meetings and talked to my sponsor, but I told her right up front, “I am not yet willing to change anything about the way I eat.” After about 6 months of “working” the steps, I received a gift from the Lord, a tiny little bit of willingness. I wasn’t ready to change the way I ate yet, but I found the willingness to start recording what I was eating. Eventually I became willing to start planning my food, and eat according to my plan; more or less. (I can be stubborn!) I realized after a while that if I would stop and ask the Lord for the willingness to say no to myself when I was about to eat something inappropriate, He would give me that willingness! It was amazing. But this introduced a new problem. Sometimes I didn’t want to ask for willingness because I knew that He would give it to me, and I wanted the food more than I wanted the willingness to abstain from it! I heard someone say in a meeting that if she wasn’t willing to pray for willingness then she prayed for the willingness to become willing. I tried it. It worked! I don’t know why I should be so surprised. He often grants our righteous petitions, and I know He wants me to be living in a state of recovery. Willingness to change my behavior is a condition of learning to live in a state of recovery. Is there something you are not yet willing to do that you know will help you on your recovery? What? Are you willing to pray for willingness? 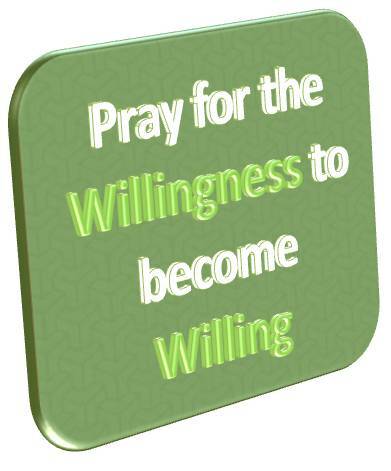 If not, are you willing to pray for the willingness to become willing? What will you do today to become willing to take another step on your journey of recovery? I am one of those who struggled with an addiction that I loved. I had to pray for 2 months for the willingness to want to ask Heavenly Father to help me to give up the addiction. When I finally had it, He blessed me with recovery. That willingness sure is an important part of recovery. I am so grateful that Heavenly Father helped me to get that. I love this story of losing weight. It is simple and sensible. Thanks for sharing.